Copyright @ 1999-2003, Lynn Conway. 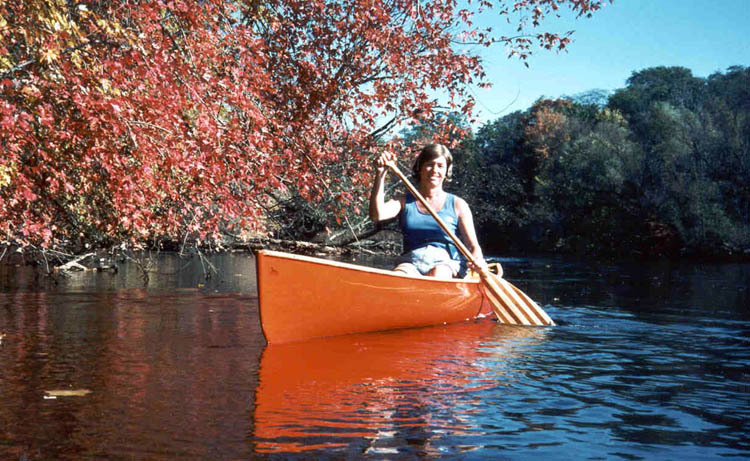 My husband and I met while canoeing near Ann Arbor, Michigan in 1987. 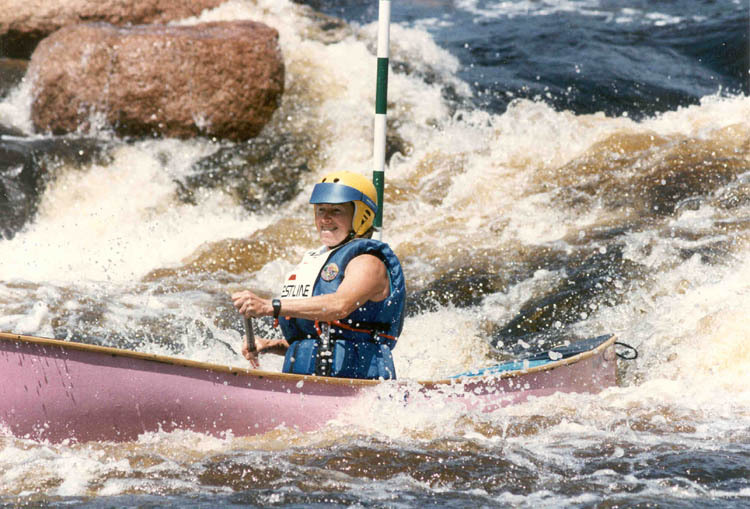 We went on to run many of Michigan's beautiful quietwater and quickwater rivers together, and to doing a lot of whitewater canoeing and slalom racing too. We've enjoyed wonderful canoeing adventures for many years now. This page tells a little bit about those adventures. If you'd like to learn more about quietwater canoeing, whitewater canoeing and slalom racing, there are excellent websites you can explore. 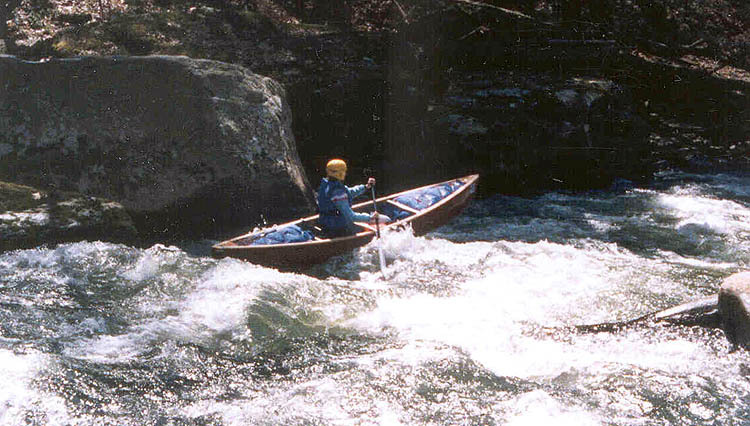 The American Canoe Association (ACA) web-site provides linformation on all aspects of paddling. 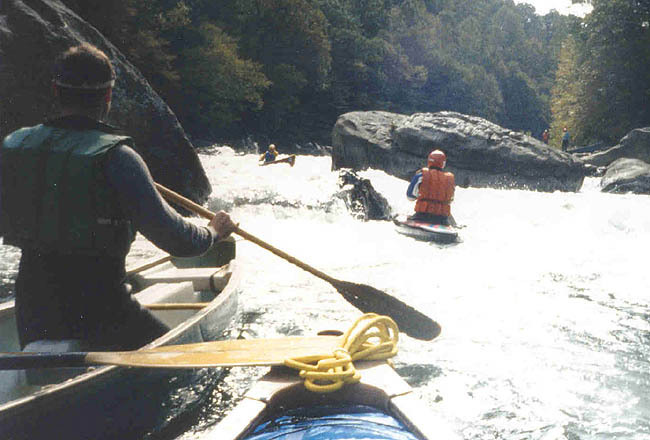 The NOC site provides information on their outstanding whitewater canoeing and kayaking instructional courses. 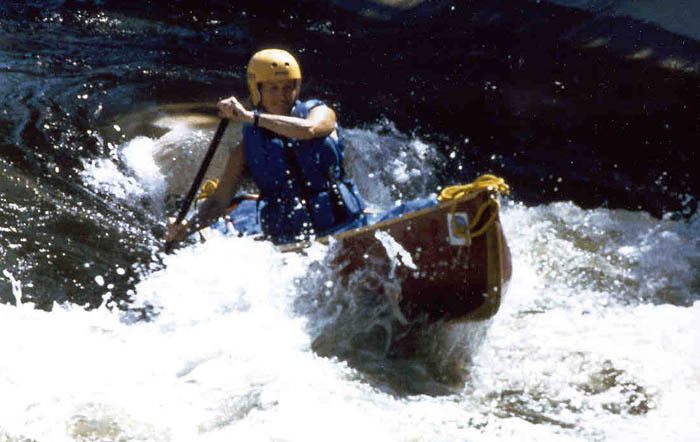 Paddling.net is a great link into buyer's guides to canoeing equipment, lists of outfitters and paddling schools, etc. The East Race and Wausau Raceway sites provide information on whitewater slalom practice and slalom racing events at those whitewater raceways. When I first moved to Ann Arbor in 1985, I was delighted by the Huron River and the beautiful parks and woodlands along it. I rented a canoe and paddled several sections. Wow, this was great! I then bought a kevlar Curtis "Vagabond" from CanoeSport in Ann Arbor (a wonderful canoeing enthusiasts' store that's since closed), and began exploring many of Michigan's rivers in this sleek, fast, lightweight solo canoe. The beauty of these rivers is incredible, with quick-moving, shallow water running over sandy bottoms, winding their way for scores of miles through wooded, mostly undeveloped landscapes. They provide an excellent environment for learning basic and then more advanced canoeing skills, and in a setting that really soothed the soul. There are many canoe liveries in Michigan where you can rent canoes to explore these rivers, and also pre-arrange car drop-offs or return shuttles. However, if you get really hooked on canoeing, you'll find that paddling in smaller "one-person" solo canoe has lots of advantages even when touring in groups. It's just more fun to have everyone in their own boat, free to explore and play at whim. 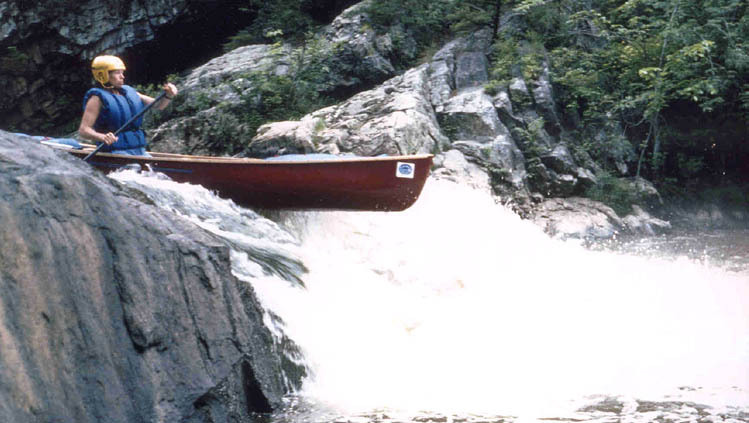 At that point you'll greatly benefit from owning your own fast, sleek solo canoe. For someone who had done lots of hiking, backpacking and climbing, canoeing was a wonderful way to re-experience the out-of-doors: silently moving along, leaving no trail, able to move closer-up to wildlife, and finding all sorts of special places only accessible from the water. The Michigan quickwater rivers can teach you a lot about paddling. But they can also get you interested in trying bigger water. I decided to go take an intensive whitewater paddling course at "Whitewater Specialty" on the Wolf River in Wisconsin. Wow! Was that ever cool! 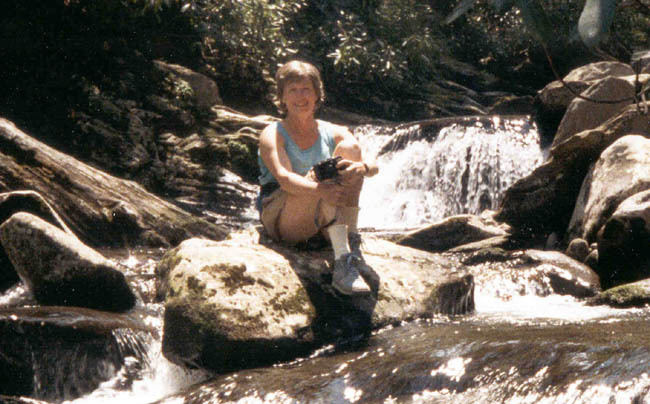 I'd just met Charlie while canoeing in Michigan, and we both then went to an intensive intermediate course at Nantahala Outdoor Center (NOC) on the Nantahala River in North Carolina. 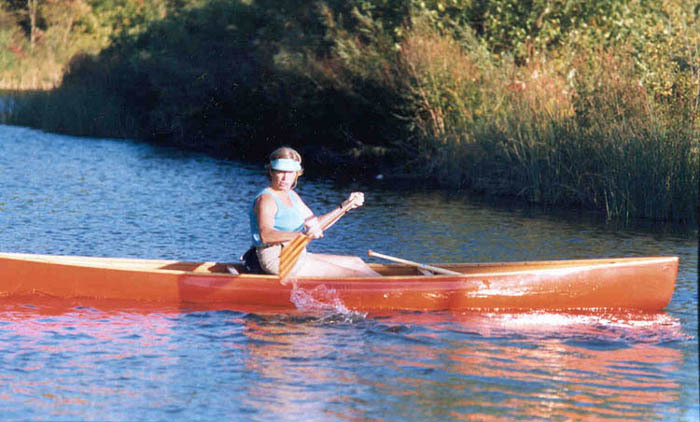 In the mid-to-late 1980's, solo canoe design was progressing very rapidly, and paddlers were running rivers in the new solo open canoes that previously had only been run in decked boats (kayaks). It turned out by great coincidence that the city of South Bend, Indiana - only 3 hours away from Ann Arbor- had recently opened an artificial whitewater course (the East Race Waterway) that was open to the public for practice sessions on summer weekends. Charlie and I began to exploit that waterway on many summer weekends to build our skills at technical whitewater paddling. Here Lynn is caught in the act, about to go for a swim. Check out that solid "air brace"! 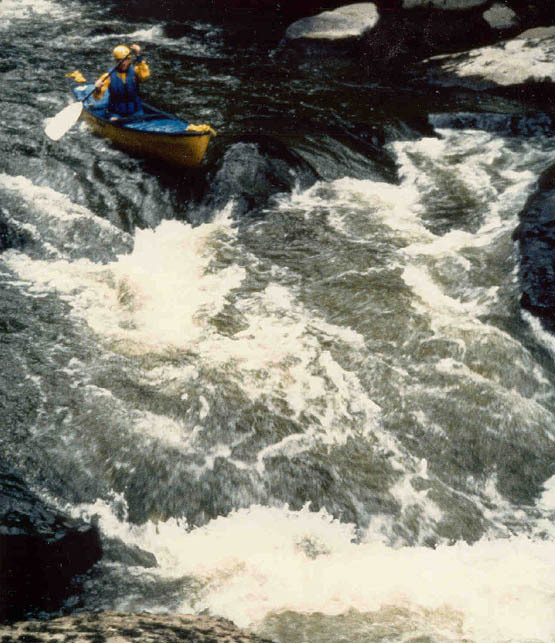 Over the next few years, we did lots of whitewater paddling. Whitewater canoeing is inherently a very social experience, since you can't do it alone. You've got to have safety in numbers, to provide protection for each other at difficult places along the way, and to rescue anyone who gets into difficulty. We looked for and found many great canoeing companions, and shared wonderful experiences with them on rivers all across Wisconsin, Western Pennsylvania, North Carolina, Tennessee and Georgia. Lynn is in the distance, partway down thru the rapid. Some of our canoeing friends had done whitewater slalom racing and said it was a great experience, so we gave it a try. We took whitewater slalom racing instruction at NOC in North Carolina and at Whitewater Specialty in Wisconsin, and then did more practicing at the East Race Waterway, the artifical whitewater raceway in South Bend, Indiana. 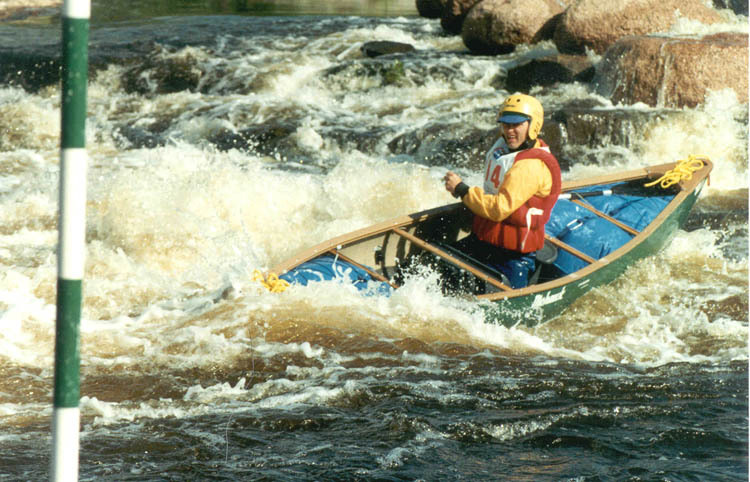 We went on to participate in slalom races at the whitewater raceway in Wausau, Wisconsin, where the American Canoe Association (ACA) held the White-water Open Canoe (WWOC) National Championships (more). Slalom racing pushes you to develop skills and methods for boat control in ways that river running just doesn't do, and can tremendously enhance one's overall paddling experience. 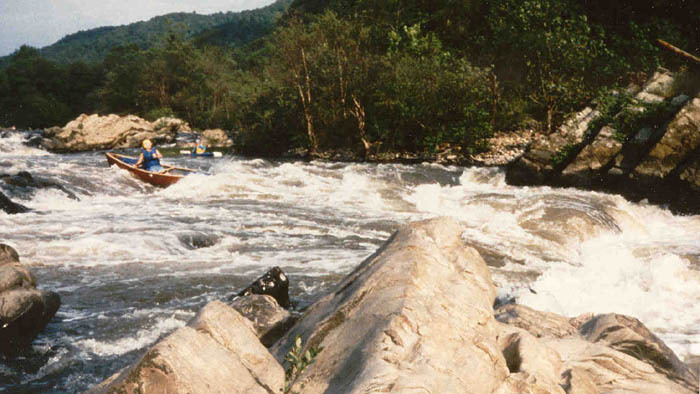 The Wausau Whitewater Raceway is an "enhanced natural whitewater course" that was created by augmenting an old natural rapids with many boulders and rock berms. The result is an amazingly complex and challenging series of pools, drops and holes that provide many opportunities of highly technical paddling, especially when "gates" are placed along the way. The race course is fed from a dam, with releases adjustable to various flow rates. It's a great place for slalom racing. You'll find a detailed map of the Wausau Whitewater Park and a topo of the Whitewater Raceway below. For more information on the raceway, check out the Wausau Canoe/Kayak Corporation website. Note that they hold training sessions (for both canoeing and kayaking) that are open to all levels of paddling skill, and the raceway itself is open a number of times each summer for practice paddling on its highly technical water. Their website contains detailed info on these training sessions, open practice sessions and competition events. 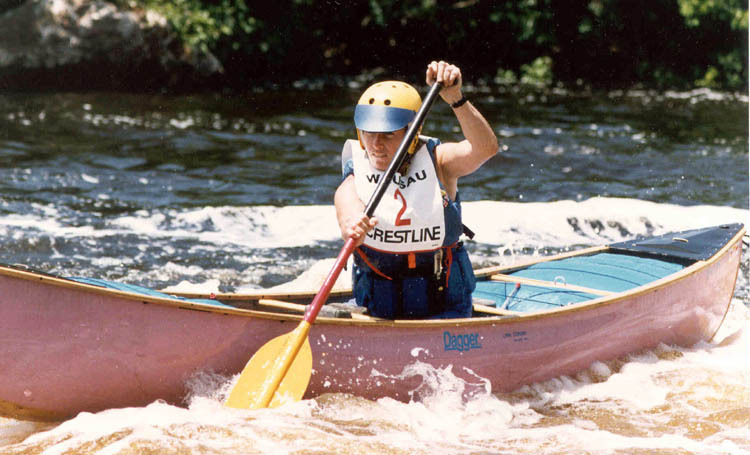 We entered the American Canoe Association's National and Divisional Championship races at Wausau in '89, '90, '91, '92 and '93. 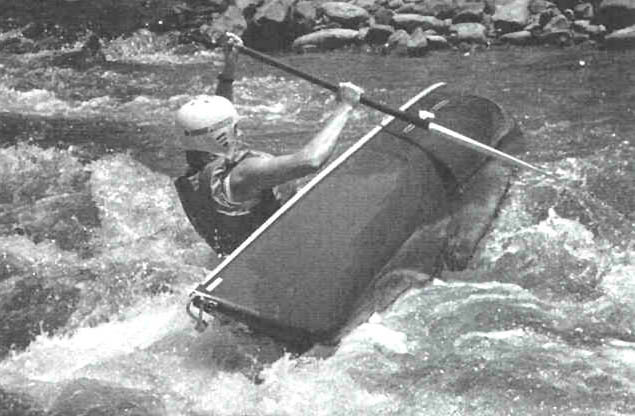 These White-Water Open Canoe (WWOC) races were divided into a number of classes, as follows. Solo boats (with one paddler) are designated OC1, while tandem boats (two paddlers) are designated OC-2. The classes were also divided into one set for the heavier production river-running boats (R) and another for more specialized ultra-lightweight competition boats (C). There were also separate classes for men (M) and women (W), although sometimes women who put in high scores were given awards in the "overall" rankings (as in '93). The starting area is at the right, and the finish is at the left. Showing gate placements for the 1993 WWOC Nationals. 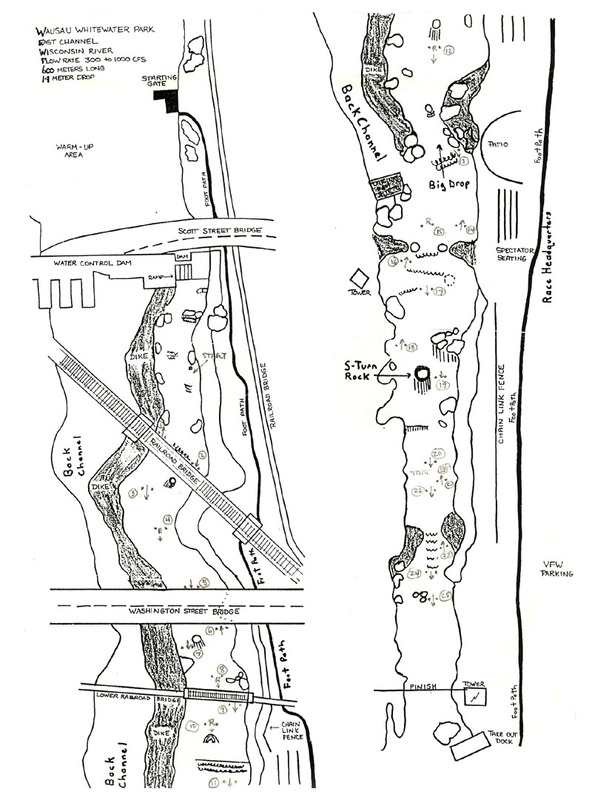 This topo of the Wausau Whitewater Raceway is sketch in two sections, and shows the gate placements for one of the races. The starting area is at the top of the left-hand section. That end of that section then continues at the top of the right-hand section, and the finish line at the bottom of the right hand section. The start of the canoe races is shown just below the Scott Street Bridge. The locations of the 25 gates are sketched in this topo, with the direction of passage through each gate is shown by arrows. Gates labeled with "R's" had to be run in "reverse", i.e., stern first.